1. Be smart and plan ahead. There are so many decisions and options – from park tickets (single admission or park hopper passes), where to purchase your park tickets (at the gate or online), choosing where to stay (hotels, motels, on the property, off property), to deciding which theme parks to visit (there are four main parks and two water parks), it can be dizzying. A good six-month head start is wise as many Disney hotels fill up long in advance. Planning will help you take advantage of continuous deals that come your way and also get all family members on board for what they like and what they want to do. You can purchase a base ticket for one-day all the way up to a 10-day, which gets you into one theme park each day of use. Park choices are Magic Kingdom, Epcot, Disney’s Hollywood Studios, and Disney’s Animal Kingdom. The price is cheaper for kids up to age 9, and children under three do not require a ticket. Add a Park Hopper pass and you can visit more than one theme park on each days of use. You can add a Water Park option as well (which specifies a number of visits Disney Water Parks such as Disney’s Blizzard Beach, Disney’s Typhoon Lagoon, DisneyQuest, and ESPN Wide World of Sports complex). If you have young children, a park a day is plenty. If you have older kids and want to move from park to park or even split up, the park hopper may be a wiser choice. You can purchase tickets at Disneyworld.ca/tickets or Disneyworld.ca/offer which also includes great Disney vacation packages. You can also purchase your tickets at a local travel agent, or at your local CAA (they have great vacation packages for members as well). The more days you buy the more you save. You can see the savings by clicking on the link: Disneyworld.ca/tickets. Buying tickets before you go, saves you time. TIP: Sign up for a free Orlando Magicard. Visit www.orlandoinfo.com/magicard, or call 1-800-825-3633. Cardholders get discounts on tickets, meals, shopping and more in Orlando. 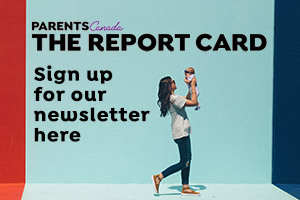 There really isn’t an off-season with Disney World but summer, March break and other holidays are the busiest times – and often the priciest in regards to accommodations. If you are going in the summer (it’s very hot by the way), the first two weeks in June or the last two weeks in August will be the least crowded. September and October are usually the slower months. Mickey’s Not-So-Scary Halloween Party in Magic Kingdom park is a riot. 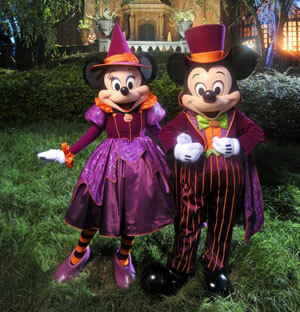 This special-ticket event runs on select nights throughout September to early November and includes a costume Boo-To-You Halloween parade, dancing, appearances by Disney villains, trick-or-treating throughout the park, and, of course, Disney’s famous Happy HalloWishes fireworks spooktacular and more. Arrive dressed up. Seeing the variety of costumes by guest was the best part. This is an extremely popular event so if you happen to be visiting from September to early November, buy your tickets in advance. 2013 prices were $54 - $73 + tax (US). Call 407-827-7200 for more information. There are so many options, this is where your research comes in. Visit Disneyworld.ca/offer for the latest Disney deals. Stay at least four nights (five days) so you can see all the parks and still have some fun at the hotel (which almost always have pools) as the park can be very tiring for all ages. While off-season dates tend to vary depending on the hotel, value season generally means January through mid-February, late August through late September, and early November through late December. Consider how much time you are going to spend at your hotel, as you don’t want to pay for a place with great perks if you are not going to use them. Find out the cutoff age for kids to stay free in parents’ rooms – it varies. When considering staying off-property, factor in the time, money, and inconvenience of getting to and from attractions on your own (complimentary buses travel regularly from the four theme parks and water parks to all Disney resorts on-property). Disney Resort: Staying in one of Disney’s many resorts may seem more expensive on paper, but in the end may even out. It makes it so much easier to visit all the parks through Disney’s ideal transportation system, the Extra Magic Hours perk, and Disney’s Magical Express (complimentary airport transportation). The above applies to those staying in Disney’s hotels. 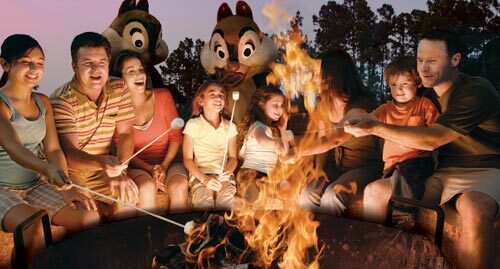 If you are on a budget another option is camping at Disney’s Fort Wilderness Resort and Campground. The resort has 799 campsites. Choose from four different types, including Premium campsites which can accommodate everything from tents to 45-foot + vehicles (with a maximum of 10 guest per site). 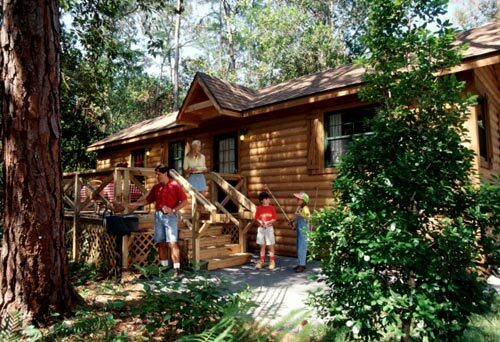 The Wilderness cabins are full-blown cabins that can accommodate up to six people. Each cabin comes with a fully equipped kitchen (saving money by cooking is a great start), private patio with picnic table, cable TV, DVD player, daily housekeeping and a Bar-B-Q. The resort was themed (isn’t everything at Disneyworld?) 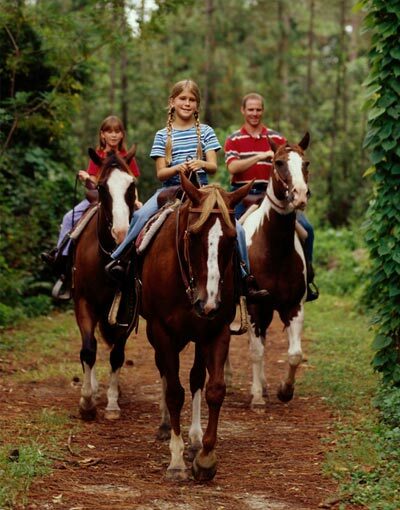 with everything western like the Hoop-Dee-Doo Musical Revue (dinner show) at Pioneer Hall (one of the longest running shows at Disney World), the Chip ‘N Dales Campfire Sing-a-Long, Mickey’s Backyard BBQ, Disney movies at the Campfire, poolside activities, and bike rides with lots of paths. It’s lovely to relax in the great outdoors after a day trekking through a theme park. And, you will keep more money in your wallet to save for souvenirs. Grab the bus or the boat to the theme parks. Tip: If you have rented a car, you can purchase your food at a local grocery store off property – much cheaper than in the on-site variety store/mini grocer. The All-Star and Pop Century Resorts are other great options for the budget conscious. They offer the lowest hotel rates on the property. Rooms at Caribbean Beach, Port Orleans French Quarter and Riverside, Disney’s Art of Animation (very kid-friendly), and Coronado Springs are slightly higher priced. Often the difference in price between the most and least expensive rooms at Disney is the view. Consider how often you will be looking out the window. 5. Get a theme park strategy. You can attack your visits in a variety of ways, from being there when the park opens, to a leisurely visit later in the day and staying through the evening. Some do a park a day, others use the park hopper passes. Be sure to get your park guide map early, and take the time to map out your route the day before. Some people start at the back of the park and work their way forward. When you have kids of all ages, you have to know which rides you will enjoy and which you will pass. Tip: Find out the height requirements to avoid meltdowns. Use a highlighter to mark your route through the park and look up which ones offer the Fastpass (a free ticket that lets you come back at a scheduled time and skip the line-up – usually the most popular rides). You can even mark the washrooms, where and when to stop for snacks, lunch, dinner. It all makes for an easier and more efficient time. Remember, Walt Disney World is a staggeringly large place. One Disney staff member told me it is roughly the size of Ottawa. So, be prudent, create an itinerary so everyone gets to visit their favourite spots and have fun. After all, you are in theplace where dreams come true.